We know foundations are generally constructed below ground level. The depth of foundation placement depends on the frost depth, upper shallow black cotton soil layer or other expansive soil layer, deposition of wastage or debris in foundation site, some time on scouring depth and on many other aspects. We have provided requirements of foundation placement depth in previous post. We are considering here a shallow foundation excavation that can with stand without support. Now our soil is sand. We have discussed factors to be considered in open excavation having no support very before post. The slope that can be made steepest in sand depends on the experience in a particular locality. We are here proving a general information about sand slope stability. At first we have to learn properties of sand. We know sands have very small cohesion in most cases. Sometimes it shows small amount of cohesion due to because of some moisture contains in it. As sand have small amount of cementing materials, the slope that can be provided in excavation should be flatter than a cohesive soil like clay. So permanently exposed excavation slope in sandy soil is considered unsafe as foundation engineers cannot depend on this low cementation properties. 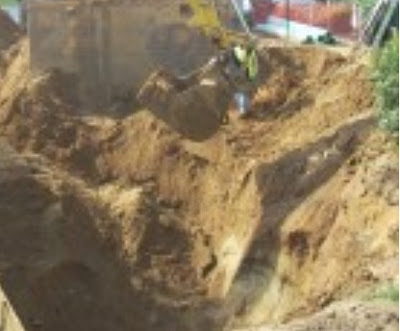 But generally excavation in this soil is done and left open for small period and quick foundation work is done to backfill the foundation trench.